Categories: Inner Silence | Permalink. The human vessel is “transmuting” as the lightbody frequency is literally alive with light. This light strengthens, aligns, awakens and is literally “transforming” your very being as you are evolving into light. This light has always been around you, and at this time the human vessel is altering in its “transfiguration” into Homo Luminous. You are awakening and physically doing so throughout every part of you. As your vessel (body) is taking in more light there may be some resistance felt. There are many symptoms of ascending vibration and the human vessel portrays these alignment vibrations in many ways. You are guided to be still and know, that any light embodiment symptoms will soon pass as your vessel adjusts to the new frequency. There are many adjustments now taking place. You have felt this on some level, be it emotionally, physically, mentally or indeed “spiritually”. Much of which you have done in the past, which is habitual and conditioned in nature, which has found its home from within the limited consciousness, will no longer sit well within these new light Quantum vibrations. For they are of the highest, purest, most positive ‘Ions” that are filtrating through your energetic systems, as what can best be described at this time as electromagnetic energy spirals, working deep into the DNA. Rainbow, metallic, sparkling, divine Source emanating as light within. You are being “illuminated”. These symptoms will lessen. They serve as marker to validate the light integration. These symptoms show how much man has literally “existed within his thought led processes” and as these symptoms that are “fired up” lessen, man will begin to live from the higher light frequency, which is heart led not mind fed. Much is occurring within the light transition. You are literally becoming Light. Yes, there remains the physical body, and when we mention dimensions we invite you to look at this as vibrational dimensionality. As your vibration is raised through the light connectivity, you are literally able to transcend above and beyond the linear stasis. That is, you are now, as you surrender unto the divine transformational process, and acceptance thereof, able to journey to higher vibrational dimensions of “reality”. This becomes real. It is not something outside of you or separate but part of you. This is why when you are meditating, you are now able to link in more swiftly and be one in to the higher realms through Quantum Connectivity. 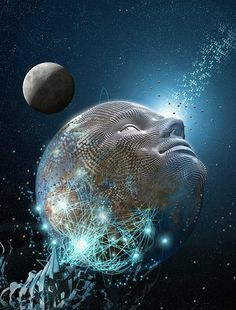 As your consciousness expands outside of the linear, corporeal, living physicality into the embracing of all that you are through light evolution, you are awakening and becoming that which you are already “programmed” to be. Conscious Awakening into your Becoming. Awakening unto the light, that courses through your very being. Physical shifting to liquidity, fluidity as you are one with the light. You are programmed and divinely designed this way. There is no evading. It is and will be and is occurring now, outside of your earthly conditioned beliefs and rigidity in concept. You can choose to journey unconsciously or you can choose to journey consciously. Shifting, aligning, awakening to your divinity as you are literally transforming into Quantisity. This is your sovereignty. Become, be still and know. This light not only works on the physical, emotional, mental and spiritual aspects of the human vessel, but it enhances the 5 senses, almost adding on a 6th sense. You are awakening to your infinite capabilities through cosmic light transfiguration. You are able to tap into this frequency. It is instilled within your DNA. You are without limitation. It is only the carnal structures that limit you to linear, physicality, when above and beyond you are part of the all, and have the innate ability to just be light, and all that this brings with it. Awaken within your conscious being, to the light evolutionary process. In those moments that you are lost, you have an internal, Eternal light that shines and will show you the way. Listen, feel, go within. In those moments that you are lost take a big breath in and stop. Don’t think, don’t even analyse, don’t do a thing….do no-thing…..just be….and in this moment of connection to the internal light within you will see your heart that shines and beats to the rhythm of the Universe. To show you that when you connect within even if just for a moment, you are shown the answers to every and any question you may have…..that the answer is just to be….and in that trust and surrender moment, the universe is greatly assisting you, because, dear One, you have stopped and taken a breath, and let go and released…..and in this time of divine connection much will be shown to you….hand over, all of it, in that very breath, and know and trust that all is well, that the Universal rays of the ONE are with you and working for you….you are never alone…..take that pause, let go and trust, release from the linear matrix and listen to your heart, your breathing rhythm and allow Source to unite you with the infinte you. In the moments you feel chaos or feel burdened, go within. In the moments of doubt and density go within, if only for a moment. Breath, sigh and just to be. And in this moment there will be a great unification within where you will know what to do. For anything that is turbulent or perturbs you is your soul light or you may know it as your internal guidance system/emotional guidance system, alerting you to stop….take a moment and release….and all will be well, as you hand over to the One. Let the star light guide you and bring you home. Have faith and trust. Categories: Eternal Light, Source Vibration | Permalink. There is divine order within all things, created by the Creator, from divine light formations. This light exists in all things. This light works throught divine order. The key for us is to be in divine order, not scattered and living in a chaotic formation, but surrendering to our divine ordered blueprint. The light brings order to all things, and in our divine surrender we become unified. Not only with all that is created but unified within our own being. No more the chaos and disgruntled, discombobulation that man has created for himself, but living freely, in divine opening, divine connection, with and in divine order, divine equilibrium, divine grace ensues. Categories: Divine Order | Permalink. It is not that you have limited consiousness, your consiousness is fully expanded and part of the Whole, and beyond limits/beyond measure. What is perhaps limited is your understanding of how magnificent your consciousness is and what it can do, what it is opened to, what it fully is and what it is part of. So let go of the limitations you bestow upon yourself and open yourself up to the true magnificence and magnitude that you are. Living from limitation only serves to keep you from divine truth. Allow yourself the beautiful journey of expansion and self realisation that lies beyond the boundaries that you have placed around you. The world is not how you perceive it to be from a limited perspective. The world, the universe and all that resides within is all part of the Great Mystery, the Great Truth and Magnificence. It is only you that places limits and falsety upon yourself. Open to the grace and truth of the all for there is a power and light beyond all measure that you are a part of, that is actually who you are. Why would you therefore choose to live through limitation?. Categories: Consciousness, Uncategorized | Permalink.